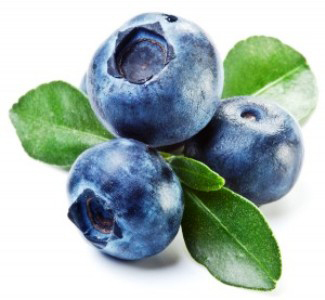 Blueberries are the fruits of a shrub that belong to the heath (Ericaceae) family whose other members include the cranberry and bilberry as well as the azalea, mountain laurel and rhododendron. Blueberries grow in clusters and range in size from that of a small pea to a marble. They are deep in color, ranging from blue to maroon to purple-black, and feature a white-gray waxy “bloom” that covers the berry’s surface and serves as a protective coat. The skin surrounds a semi-transparent flesh that encases tiny seeds. Cultivated blueberries are typically mildly sweet, while those that grow wild have a more tart and tangy flavor. Fresh berries are very fragile and should be washed briefly and carefully and then gently patted dry if they are not organic. Wash berries just prior to use to not prematurely remove the protective bloom that resides on the skin’s surface. If you know the source of either wild or organic berries try not to wash them at all. Blueberries are grown from Far North Qld in the Atherton tablelands and as far south as Tasmania. The are also grown in Vic, S.A. W.A. Blueberries are available ALL YEAR round, however the peak production occurs from November to February. 3/4 Cup Whole-wheat pastry flour. 1 Tea Spoon Baking powder. 1 Table Spoon Finely shredded lemon peel. Preheat the oven to 200-210 degrees Celcius. Spray six large, 3-inch muffin cups with nonfat, nonstick spray and set aside. In a large bowl, stir together both flours, sugar, baking powder and lemon peel, making sure all is evenly distributed. Make a well in the center of the mixture. In a small bowl, beat the egg whites until foamy. Stir in the buttermilk, applesauce and vanilla. Add the liquid mixture to the dry mixture and stir until just moistened. Fold in the blueberries. Spoon the batter into the prepared cups, filling each 3/4 full. Bake for 22 to 25 minutes or until a toothpick inserted in the center comes out clean. Cool the muffins in the pan for 5 minutes, then remove them to cool on a wire rack. NOTE: For standard-sized muffins, bake for 18 to 20 minutes or until done. Black, red, and white mulberry are widespread in southern Europe, the Middle East, northern Africa and Indian Subcontinent. Black mulberries are native to southwest Asia and were imported to Britain in the 17th century in the hope that it would be useful in the cultivation of silkworms. It was much used in folk medicine, especially in the treatment of ringworm. The red mulberry is native to eastern North America. 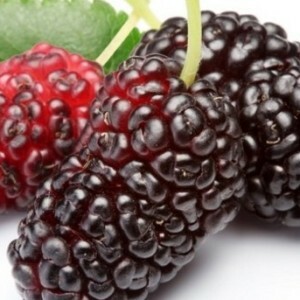 Both the red and black mulberry have the strongest flavor. Mulberries can be eaten fresh out of the hand or used in cooking to make jams and sorbets. 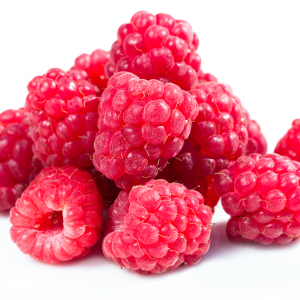 The raspberry is the edible fruit of a multitude of plant species in the genus Rubus of the rose family. 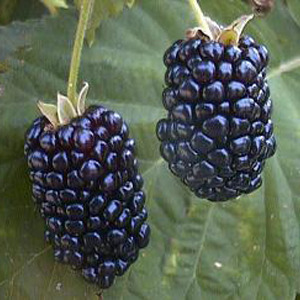 The black raspberry, is also occasionally cultivated in the United States. Purple raspberries have been produced by horticultural hybridization of red and black raspberries. Commercial production of purple-fruited raspberries is rare. Blue raspberry, is a local name used in Prince Edward Country, Ontario, Canada. Both the red and the black raspberry species have albino-like pale-yellow natural or horticultural variants, resulting from presence of recessive genes that impede production of anthocyanin pigments. Raspberry are best eaten fresh out of the hand. They can also be used in jams, drinks and deserts. The fruit is very dark purple to black with smooth, fragile skin. In the middle of the cluster is a greenish-white core that extends to almost the bottom of the berry. Blackberries can be easily confused with raspberries, but raspberries (including black raspberries) have a hollow center. The fruit is eaten out of the hand raw. It is mainly used in fruit salads or as a granish on top of or along side desserts.